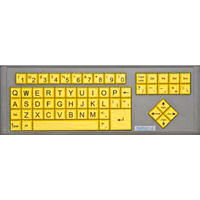 This keyboard features easy to target 0.75" x 0.75" keys, and is the only keyboards which offers full 101 key keyboard functionality with a large key keycap. All BigKeys keyboards are hard-wired to be switchable between ABC and QWERTY layouts, and you can rearrange the keycaps to match custom layouts you may have created in your operating system or software. 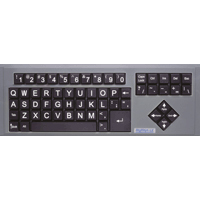 The Function Keys are generated by pressing and holding the 'F' key and then the number i.e. "F" (as a modifier) and "3" becomes F3. Pressing and releasing the F key generates the usual letter F. Available accessories include protective skinguards (to prevent against damage from spills, etc.) and rigid plastic keyguards are available for individuals needing further targeting assistance. All keyboards have a grey housing, but color options on the keys are as follows: White Legends on Black Keys, or Black Legends on Yellow Keys. 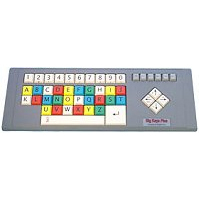 This is the older version of the Big Keys Keyboard and is native PS/2 instead of USB. All keyboards have a grey housing, but color options on the keys are as follows: Black Legends on White Keys, White Legends on Black Keys, or White Legends on Coloured Keys.